It seems like you have placed the Lightbox box embed code incorrectly. 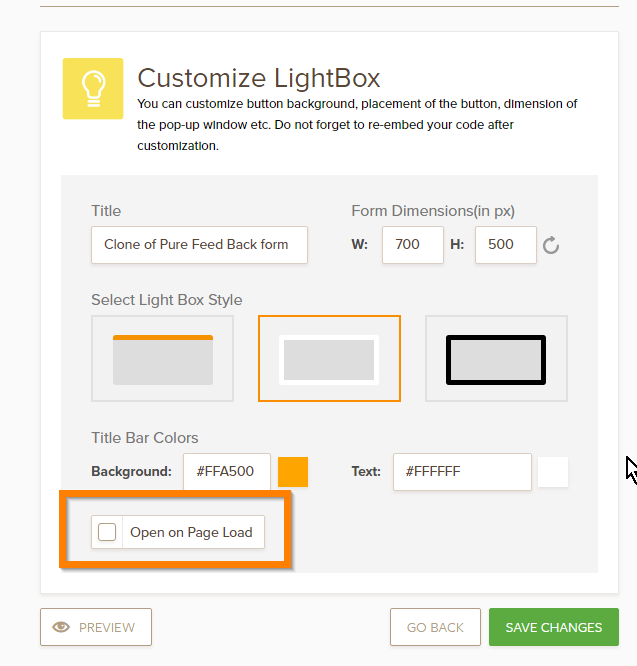 As mentioned in this guide https://www.jotform.com/help/140-Using-cookies-to-auto-open-a-lightbox-form-per-browser-session. You need to paste the script in between the second <?php ?> code. Also, your webpage needs to run PHP scripts, pages ending in .php. Your website is only in .html. You also need to have a working web server for this. Please do follow the steps mentioned in the guide and make sure that your page is able to run or load PHP scripts. Hi Charlie, is there a way of doing this in html? I can't make the page php. Here's my test website page: https://shots.jotform.com/charlie/script_cookie_saver.html. It is an HTML page, however, you need to make sure that your website can run scripts. The green highlight in my final code is the original code from the lightbox. The yellow highlight in my final code is the custom script that you need to add. The text set in bold are the actions taken. The first one allows you to set actions on what to do is the visitor is just returning on that session, meaning it's not the first time he/she visited the page on that time. The second part is the actual JotForm lightbox embed code, I'm basically displaying the form and at the same time setting up the cookie for that user because he's a first time visitor. I am also trying to incorporate a delay on load, which I did have working but before. Is there any way of having the 2 functions working together? The only change we need to apply on our Lightbox embed code is we will NOT enable the "Open on Page Load" option. You can check my sample website here: https://shots.jotform.com/charlie/lightbox_cookie_based_with_delay.html. It has a delay of 10 seconds before the Lightbox opens. Let us know if you need further help on this. You are most welcome. You should you need our assistance again, please do not hesitate to visit us here in the forum.